You have decided you want to quit your job and you just need to write it down in a resignation letter? 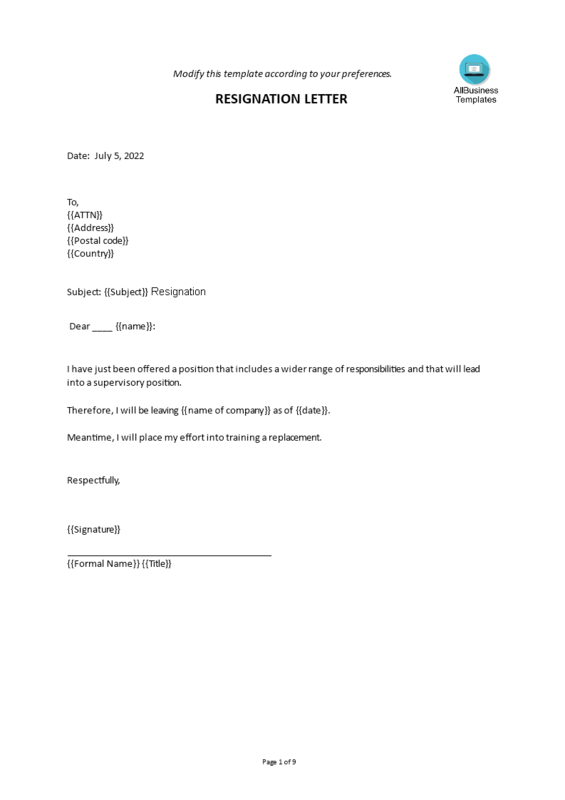 Download Letter Of Resignation Template! Obviously, a resignation letter is a, generally very short and formal, letter that is informing your boss or employer that you are quitting your job. By writing a resignation letter, you can help maintain a positive impression of yourself and keep a good relationship with your old employer by leaving with a strong and positive final impression, while also paving the way for you to move on. This also an important reason why you should write e a Resignation Letter. Since this letter of resignation is written to announce all stakeholders, such as: HR, other superiors, and co-workers your intentions to leave your current position. In order to rapidly manifest your needs, you need to get clear on paper. This letter of resignation is a formal letter written to announce the author's intent to leave a position currently held, such as an office, employment or commission.We provide a Resignation Letter for quitting a job as a Word Document (.docx), which you can easily fill in and modify to your wishes. Make sure it is a polite letter that you are sending, and make sure you send this letter out well in advance (especially check with your contract), with for example two or four weeks, which is, in general, an accepted minimum period of time. Please also consider this, especially if the relationship with your employer was not that good anymore in the end: You never know when you might need that previous employer to give you a good reference, so it makes sense to take the time to write a polished and professional resignation letter. Your resignation letter also provides the official notice and date and termination of your employment with the company. Our templates are helping you to reach the next level of success in your work and business. Please make good use of it! Download this Letter Of Resignation template now! Fast, safe and easy!